Through my Everyday Magic online photography course, I’ve seen some absolutely beautiful, breathtaking images. I notice that my favorites tend to be of the west coast. The above photo I took a few years back when I was on the Oregon Coast, driving southward from the Cannon Beach area. I haven’t touched up the image, but can’t wait to play with it with some of my camera apps! Have you ever felt this pull to be somewhere else? And felt it your entire life? As many years back as I can remember, I have wanted to be there. 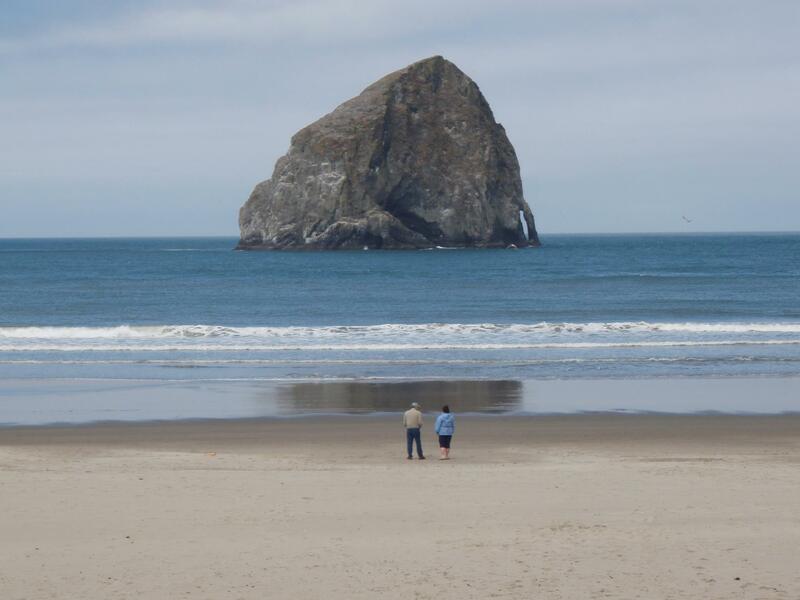 I remember both of my trips down the Oregon Coast like they were yesterday even though one took place almost 20 years ago. I took the first with an old friend, and the second one all on my own. Both have seared images into my brain. I rememeber how my friend and I felt that first time we hit the Pacific Ocean, with all of the sea stacks jutting out from the water. On the the second trip, I remember sitting near Cape Perpetua for several hours, just watching the waves crash onto the shore.For too many years of my life, if I felt a pull toward somewhere or something, I would bury it inside if it wasn’t along the “right” or “expected” path, or what I thought would fit those two adjectives. During the first year on my own, I was afraid to be with my own thoughts and feelings. During the second year, I started to learn more about them and myself, but I was still somewhat lost and feeling my own. During the past, and third year, I was beginning to sense some big changes in me, and the way I thought about things. Yet, I was still kind of holding those changes just below the surface because I was in love and thought that, deep down, my partner understood me. I was wrong. When I look back, i think that relationship happened so I would be where I am today, knowing and feeling what I do now. It’s hard to describe, but when I saw some of my classmate’s photos, I just felt this pull, and the question of “what are you waiting for?” enter my mind. Other than my debt, I don’t have the usual appendages to worry about that others my age do. I’m not attached to anyone, nor do I have kids. All I have are my fur babies who mean everything to me. So, my plan is this: keep paying off my debt like a she-demon that has no tomorrow, increase my personal training skills and knowledge with more classes and hopefully an internship of sorts, and possibly get another job on top of the 45 hours per week I work now. I feel like if I just keep my eyes set on the end goal, while still taking time out to breathe and appreciate the beauty in my days, I can make it through this. I will get there, I just have to keep faith. What a great post Terri! I love how you’re paying attention to what’s drawing you, set an intention and crafted a plan! Thank you for your sweet and generous thoughts . . . I too feel a connection with you and look forward to meeting you in person soon! I reread your post today Terri and thought I’d send a little word picture of the morning here in Bodega Bay . . . 6 a.m., still dark. I see the bright lights on the fishing boats as they head out of the harbor for a morning on the water. As the sun rises it reflects a perfectly calm bay with flat, clear water . . . there’s an autumn chill in the air but not a breath of wind. I brew my morning tea and think about your dream to be here on the West coast. I picture you riding your sky blue bike to the gym where you begin your day as personal trainer extraordinaire. As your day winds to a close you park your trusty bike and drive out to the coast for a beach hike . . . you’re blissfully happy . . . you’re home . . .
I’m not sure why, but I didn’t see this comment until just now. Maybe because it recognizes you as an approved commentator on here, so it didn’t jump out on me. I know we have never met, but you just described my dream to a T. You have no idea how accurate that picture is to what I keep seeing in my mind. (Yours is actually even better, so thank you!!) So happy to have met you!